Launching in June, the camp hopes to serve 100 children this summer on the Davis Academy campus. 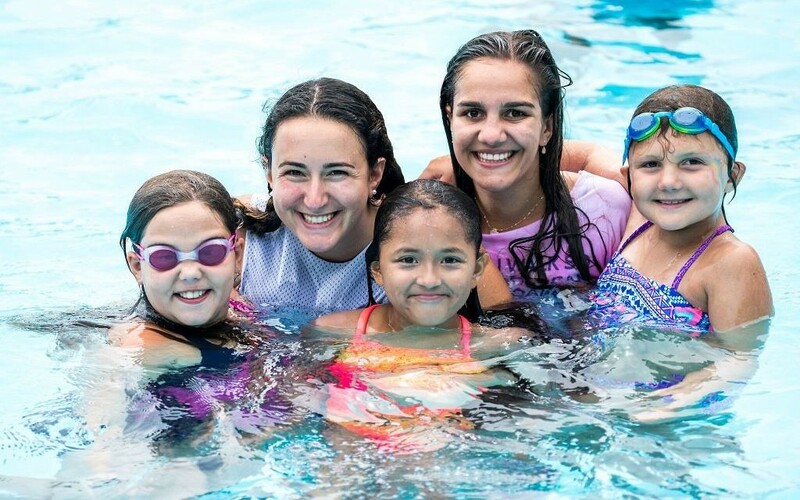 Counselors Emily, 25, and Sophie, 22, swim with campers Keira, 10, Genesis, 11, and Kaitlyn, 10, at Sunrise Day Camp-Long Island. 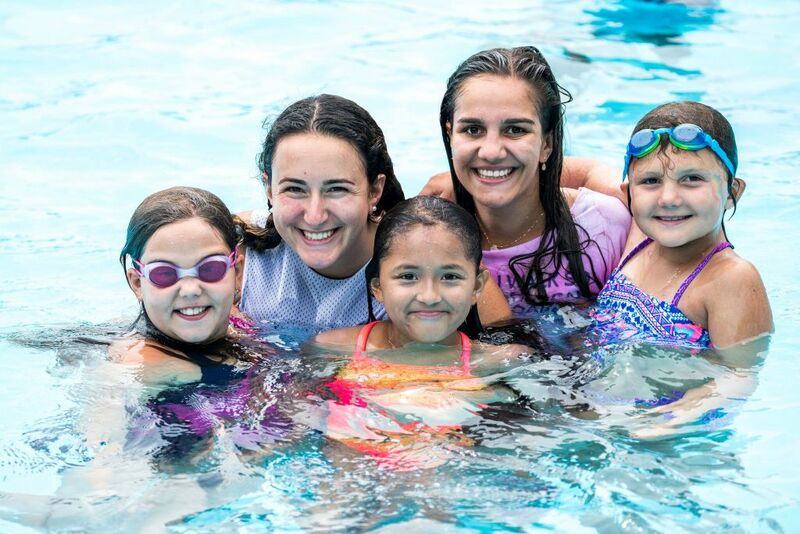 Georgia has several sleepaway camps, but this is the state’s first full-summer day camp that gives children who are in active or follow-up cancer treatment the chance to regain the joys of childhood. The camp accepts kids ages 3½ to 16 and takes place at the Davis Academy, about seven miles from Children’s Healthcare of Atlanta at Scottish Rite. In addition to the counselors and unit heads, the camp will have a medical team on site, as well as a wellness center coordinator, two nurses and a medical coordinator, plus an on-call doctor. 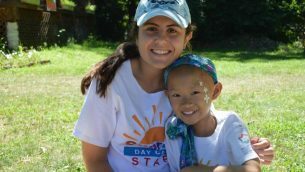 Counselor Isabella, 17, works with camper Audrienne, 10, at Sunrise Day Camp-Long Island. Samantha Tanenbaum, Aurora’s director of camp and year-round programs, said the camp and all its services for each family will be free. The camp will have weekly themes and decorations to help transform the school into a camp, Tanenbaum said. To help pay for giveaways and some supplies, Tanenbaum’s mother, Randi Gannon, started a GoFundMe campaign to raise $2,000. Tanenbaum said her mother, a teacher in South Florida, launched the page because she supports her work and because she wanted to get her community and school involved in a good cause. Children may attend for a day, a week or 6½ weeks, Tanenbaum said. The camp hopes to enroll 100 children this summer, but families can wait until the last minute to enroll to be sure their children are well enough to attend because there is no deadline to apply. “Everything is on their terms, and our philosophy is to be as accommodating as possible, which really resonates with people,” said Tanenbaum, formerly the community camp ambassador for the Jewish Federation of Greater Atlanta. In 2006 a Jewish community center in New York opened a summer day camp that served 96 children with cancer. The program spread, and the Sunrise Association has seven day camps before Aurora’s opening: three in New York (Long Island, Pearl River and Staten Island); three in Israel (Beit Yehoshua, Be’er Sheva and Ramat Yochanan); and Horizon Day Camp in Baltimore. Tanenbaum said Aurora will offer everything from sports, arts, drama and creative writing to gymnastics and will have special events, such as a carnival at which Circus Camp will work with the kids.